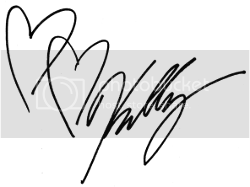 I don't know if you've noticed this on my Facebook, but I LOVE Maisie Shine. Sometimes a new indie maker just blows my socks off, and she has done that. I want to own her entire collection one day... it will happen!! So, when she posted the pictures of her new set, Fairy Tales and Dragon Scales, I knew I had to have it. They were so pretty unique compared to other polishes out there! I couldn't decided which on to wear first, so I closed my eyes and grabbed one... Fairy Tales was the lucky winner!! The first coat had me a little worried. The coverage wasn't very even and it was very sheer. But the second coat smoothed it right out!! The shimmer did show a few strokes, but it wasn't super noticeable and didn't take away from the polish, in my opinion. There are holographic, hexagon glitters along with silver (but with the polish, they look lilac/lavender) hexagons and white stars. The stars are the best part, and I didn't have to dig for them in the bottle at all. All of the stars you see came out on the brush by their own, free-will! Later this week I will be showing of Dragon Scales... I can't wait to give it a try!! 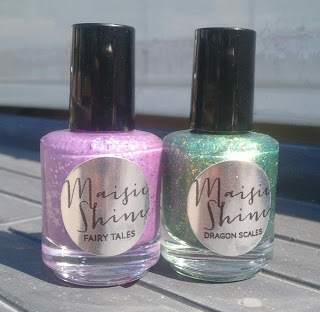 You can purchase Maisie Shine here. This set is $16, or $9 for one of them. Be sure to follow her on Facebook for updates on shop openings and new pretties!!! !